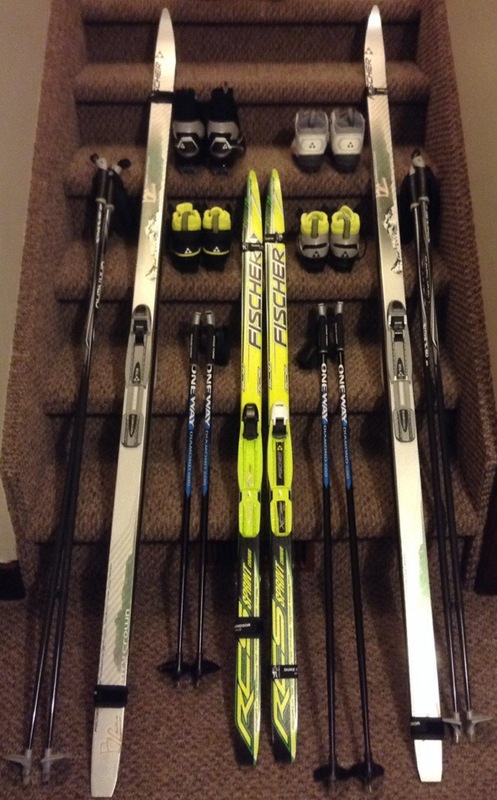 Our family just finished buying cross-country skis, boots, and poles. On Family Day this past February we ventured out to Hiawatha Highlands and rented some equipment to give it a whirl. Kerri and I have both skied with our classes and as kids, but our children hadn’t tried it before. We’re not expert skiers, and so we’re not expert skiing teachers. We are trying to sign the kids up for lessons (success for our daughter; hoping another class opens up for our son). If that doesn’t pan out we’ll just take him on the trails with us. Looks like Hiawatha has trails groomed and open, so we’ll be getting out there soon. We also live in the country east of the Sault, and we have 15 acres to tromp around in ourselves. Kerri and I bought Fischer Country Crown skis, as wide as possible while still narrow enough for the groomed tracks. I took the kids out in the front yard last night for 20 minutes, and they had a great time making lines in the fresh snow. Lots of fun – looking forward to lots more family time this winter! Sometimes I take a while to write what I feel is a “complete” blog post – you know, the kind with headings, links, images, charts,… But when I’m reading posts, I often don’t want to see that. Organized and with headings, sure. Many screenfuls of stuff? Not really. So here’s my plan – I’m going to try to write more shorter, less planned posts. Like this one. In favour? Let me know. Prefer the longer stuff? I can do that too, and I’m sure I will. Maybe the short ones will be to get stuff out of my head, and the long ones will be to consolidate my thinking. Sure, let’s say that. David and I have been chatting on Twitter for quite a while, and I recently spent a day at his school, working with his staff on e-Learning, Blended Learning, and more. And so I “casually encouraged” him to start blogging, mentioning that I’ve found it to be a really valuable exercise. I referred to a recent post (I think it was this one), which he told me he’d read and that he was now going to (re)start. We talked a little about platform, and I suggested WordPress.com. So I think it’s appropriate for my 100th post to happily congratulate David on his first. Kind of meta. Also, I wanted to share his work and to encourage everyone to participate in the conversation he’s started there. I’ll be involved, and I’d love to see others join in. You can connect with him as @DavidJaremy on Twitter and http://davidjaremy.wordpress.com on WordPress. Warning: he also likes to talk about hockey. Has anyone tried to co-author a story? I thought about this today – what would it be like to try to negotiate a group of characters, a setting, major plot elements, and so on with another person? I listened to Writing Excuses several months ago (maybe a year ago? If I had Internet access I could check! ), and in the episode the hosts were hammering out a story idea (a tidally-locked world in which one culture was in perpetual darkness and the other was in perpetual daylight, as I recall). The process was very interesting to me, and I thought it would be interesting to try. But not knowing anyone else who wanted to write fiction for fun, and not really having time to spend on such a project anyway, I didn’t do anything with the idea. And now it returns, in my evening in Hornepayne, because I have time. Tonight, at least. Of course, I can’t actually collaborate tonight since I’m not connected, so this is more of a thought experiment than an actual proposal. I like to outline a story before I write it, even a very short story. I like to plan it out and then just fill in the prose. I think my stories are better if I take the time to do this, and it seems those stories are more likely to be completed anyway. The stories I’ve written “organically” or by “discovery writing” tend to be terrible; maybe they just need more post-writing effort. But collaborating on an outline (I’m imagining this in a Google Doc or Spreadsheet) sounds pretty difficult. Maybe a Hangout would be a better way; this feels like it would be best done live, not asynchronously. If you’re creating a world, or even just a local context, the details are really important. How do you make sure both/all of the authors have a consistent knowledge of the environment, history, circumstances, …? You have to record it all, no? When I watch a movie adaptation of a novel I’ve read, the characters are never quite as I envisioned them from reading. Sometimes this is because the director/casting director/whoever has departed from the author’s vision (Tom Cruise as Jack Reacher?!? ), but sometimes it’s just that my interpretation of the character is flawed or incomplete. How difficult would it be for multiple authors to settle on characters together? I used to read a lot of Star Trek novels, which were written by several authors (one at a time, though). They had a world to write inside of, with history, existing characters, and even future arcs to consider. I imagine that would be both easier and harder in some ways. Wouldn’t collaborating on a story have similar advantages and difficulties? This isn’t something I’m going to do right now. I’m just thinking out loud about it, and maybe I’ll return to it someday when I have fewer projects on my plate. If you’ve written with someone else before, or have thoughts about what I would be like, I’d be interested to hear about it. I know I just said SciFi is really hard to write, but Fantasy is too. Not quite as hard, I think, but still pretty difficult. The fact that you get to design a world can make it much harder than “regular” fiction. The problem is that Fantasy stories still have to been internally consistent. 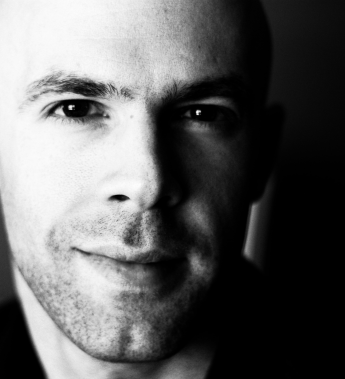 If you’re writing something that’s set in the “real” world, you already know all the rules: you’ve lived with them your whole life. The physics is determined. You have lots of reference materials for different cultures, governments, history, etc. In a Fantasy world, you don’t have the reference materials. Or if you do, as in “Urban Fantasy” set in real-world cities, you mess it up by introducing a magical element. And those fantastic changes, even if small, have dramatic effects on the nature of the world. For example, I once tried to design a “simple” magic system in which the magic user had telekinetic powers. That’s all. And nothing super-powerful, either: he or she couldn’t raise a sunken spaceship from a murky swamp or anything. But the effect was far-reaching: the person became instantly and exceptionally dangerous. If you can move anything nearby with your mind, it would be pretty simple to become a weapon (I’m reminded of the Coinshot in the Mistborn series). Or forget the makeshift bullets – just move a tiny part of a foe’s brain, without moving the rest of their body accordingly. Dead. And that’s always bothered me about magic systems. There is almost always an easy way to use it in an extreme fashion to take over the whole world. So my telekinetic sorcerer doesn’t exist. Maybe I should have started with the character and plot without thinking about the magic system, but the magic was the part I was most interested in. I also wrote a short story in which the protagonist was learning about magic, and the boundaries were unclear. And as I introduced the effects of the magic (one person hadn’t aged in a long time, for example), I realized that I didn’t know how it worked, and that was a problem. What were the boundaries, and were they different for each magic user? I also considered how prevalent the magic was – could anyone use it? Was it equally powerful for everyone? Did the magic have the same nature for every user, or did each person access it differently (as in the elemental styles we’ve all read about)? And working through those questions, I recall how in many, many fantasy series, the magic-wielding character (of any experience level) becomes exponentially more proficient as time passes. Even the characters who are supposedly expert users at the beginning of the story make choices which seem quite novice in the context of the understanding the reader develops later. “Why didn’t he just do X at the beginning?” I often find myself asking later, once the nature of the magic is known. I fear it’s because the author wrote the beginning of the story before discovering all that the magic could do, before considering all of the ramifications of his or her choices. So Fantasy is really hard to write also, and giant kudos to the authors who are good at it, because they are awesome. I’ve tried to write down some story ideas in the last year or so, and I think Science Fiction is the most difficult genre to write in. You have to know science. That is challenging, because you have to have a broad base of knowledge; it’s not enough to be comfortable with the mechanics of space travel. For example, if you’re writing a story that’s set 200 years in Earth’s future when nanotechnology is commonplace, you’d have to think about how that affects medicine, space travel, biology, cybernetics, chemistry, and more. If you can design self-replicating nanobots, why are you bothering to create a “mining colony”? Just design some nanobots to dig the ore themselves. Oh, wait – you can just make the valuable ore “unstable” so that only people can do the mining, right? Because it makes sense that humans 200 years distant would be more precise and reliable than machines 200 years distant. Right. What’s that? You have a point-to-point teleportation device (transporter) which has planetary range? Game changer. Put that in the hands of a villain and think about what would happen, really. And not only do you have to know a lot of science, you have to know politics and history. How would human civilization develop over the next 200 years? Who should be in power? What happens to Earth’s governments when humans come into contact with extraterrestrials? What would happen if there was an energy crisis? I don’t know how to answer any of those questions, and I’m the one trying to make up the story. And, of course, there’s all the other stuff that goes into good writing: strong characters with meaningful motivations and reasonable weaknesses, interesting situations and difficult problems, long- and short-term plot arcs. So SciFi is pretty hard. Writing present-day, near-to-the-author fiction that doesn’t require carefully considering the laws of the universe seems an order of magnitude easier. Maybe I should try to translate some of my story ideas into that setting and see what happens. Maybe I won’t feel quite so ignorant.